This is a recap of the best movies I saw in 2017 that I hadn’t seen before. It was a good year (for movies). I generally admire the work of those who use non-actors or not-well-known actors in their films—Bruno Dumont, for example, though he disappointed me terribly by using Juliette Binoche in his Camille Claudel 1915, a film I avoided for a long time out of fears that, turns out, were justified. David Lynch. Twin Peaks: Fire Walk With Me. 1992. Even movies I didn’t entirely love but appreciated for some reason or other (and often the reason was the casting) showcased some utterly moving work by actors: Ben Whishaw’s John Keats in Bright Star and Cynthia Nixon’s Emily Dickinson in A Quiet Passion; James Wilby and Rupert Graves in Maurice; and Ezra Miller as the psychopath progeny of Tilda Swinton in We Need to Talk About Kevin—Miller shall soon appear, I predict, in an Anne Rice-Sally Potter’s Orlando-pastiche about a fashionable vampire coming to terms with this ability to hang out in graveyards in daylight. I despise Lars von Trier (except for the first season of The Kingdom) and Breaking the Waves is full of Trierisms, but Emily Watson kept me watching to the end. Chantal Akerman. Jeanne Dielman, 23, quai du commerce, 1080 Bruxelles. Belgium, 1975. Andrea Arnold. Wuthering Heights. UK, 2011. Terence Davies. The House of Mirth. UK/USA, 2000. Aleksey Fedorchenko. Celestial Wives of the Meadow Mari. 2012. Aleksey Fedorchenko. Celestial Wives of the Meadow Mari. Russia, 2012. William Friedkin. The French Connection. USA, 1971. Jonathan Glazer. Birth. UK, 2004. Todd Haynes. Poison. USA, 1991. Alfred Hitchcock. The Birds. USA, 1963. David Lynch. Twin Peaks: Fire Walk With Me. USA, 1992. Yasujirō Ozu. Tokyo Story. Japan, 1953. Jordan Peele. Get Out. USA, 2017. Éric Rochant. Les patriotes. France, 1994. Éric Rohmer. Le genou de Claire. France, 1970. 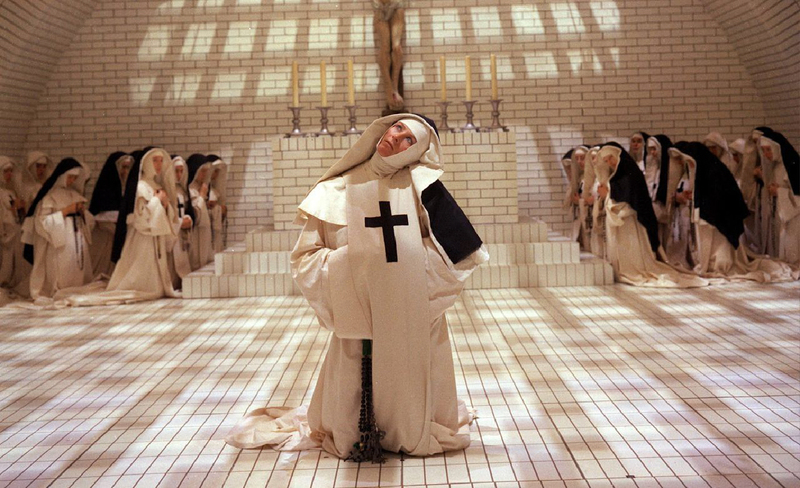 Ken Russell. The Devils. 1971. Ken Russell. The Devils. UK, 1971. Josef von Sternberg. The Blue Angel. Germany, 1930. Andrey Tarkovsky. Stalker. USSR, 1979. Agnès Varda. Le bonheur. France, 1965. Andrey Zvyagintsev. The Return. Russia, 2003. Andrey Zvyagintsev. Leviathan. Russia, 2014. Terence Davies. A Quiet Passion. 2017. Jane Campion. Bright Star. UK/Australia, 2009. Terence Davies. A Quiet Passion. UK, 2016. Brian De Palma. Sisters. USA, 1972. Saul Dibb. The Duchess. UK, 2008. Lynne Ramsay. We Need to Talk About Kevin. UK/USA, 2011. Albert Serra. La mort de Louis XIV. France, 2016. Michael Showalter. Hello, My Name Is Doris. USA, 2015. Paul Verhoeven. Hollow Man. USA, 2000. Denis Villeneuve. Arrival. USA, 2016. *I should say here that James Baldwin’s text, Baldwin himself, the archival footage, and Samuel L. Jackson’s narration are extraordinary. But the montage and those weird “recreation” bits were not. It’s like the director wasn’t willing to let the materials speak. More archival footage, less palm trees in the sun. James Ivory. The Europeans. UK, 1979. James Ivory. The Bostonians. UK/USA, 1984. James Ivory. Maurice. UK, 1987. Of these, Maurice was my favorite, perhaps due to the unusual nature of the source material itself (I had no idea E. M. wrote about gay love and, indeed, this novel was published only posthumously). The Bostonians was astonishing, Vanessa Redgrave especially, but the pro–stalker stance at the end upset me and I still don’t know what to make of it and am afraid to read the novel. Next, I’ll be watching the Ivory-scripted Call Me By Your Name. Is it good? Steven Spielberg. Empire of the Sun. USA, 1987. Bruno Dumont. Camille Claudel 1915. France, 2013. Jim Jarmusch. Paterson. USA, 2016. Natalie Leite. M.F.A. USA, 2017. Gilles Paquet-Brenner. Crooked House. UK, 2017. No, dickhead (=whoever wrote that dialogue, not the actor, who I hoped was compensated appropriately for having to pretend Japan isn’t filled with incredible translators), it isn’t. Crooked House was a romp, if you consider Agatha Christie a romp, which I do. But the detective guy is played by one severely under-talented Max Irons. Yes, Max Irons. As in the child of Sinéad Cusack and Jeremy Irons. They’ll take this allowance away, won’t they? —was ever so promising and the first fifteen minutes boded well for the rest of the film. But it went downhill and preachy very quickly. I watched The Craft again out of nostalgia. It was fantastic. I finally saw the Ab Fab movie, which was a blast, but I’ll always love the show more. I saw Wong Kar-wai’s In the Mood for Love again to test a theory that maybe I’d judged the movie and therefore Wong too quickly when I first saw it a decade or so ago. This second viewing did not change my opinion that it’s all very shallow while claiming to be profound. But if you go with the shallow (flow? ), the movie is very seductive in that seductive fashion editorial way. I also saw À bout de souffle again and won’t be doing that again. I thought Wonder Woman was dumb. David Fincher. Gone Girl. USA, 2014. Martin Scorsese. Silence. USA, 2016. Thanks for putting this together! Shall watch some of these.